On the R&M Cafe sign appearing to say P&T Cafe, are you sure that is not a 'Pet' Dairy products advertising sign? Is there also a barber pole on the corner of the building in the 1945 photograph? The area of East Chapel Hill St. and Rigsbee Avenue was primarily filled with residential and small frame structures up until the early 1920s, when masonry commercial structure supplanted the earlier uses. 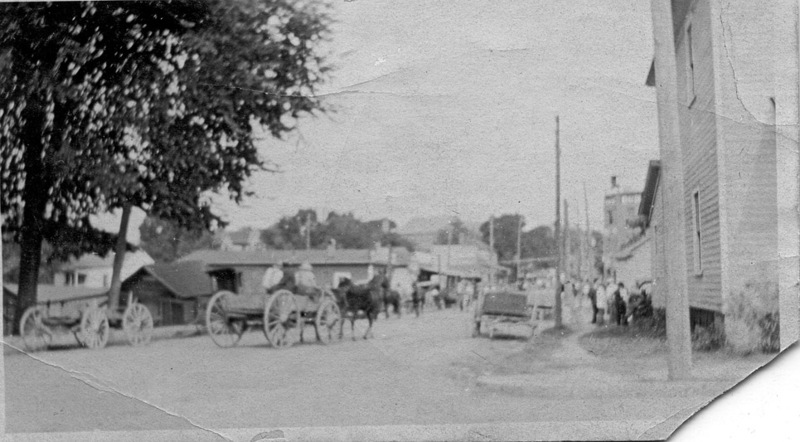 400 Block of East Chapel Hill St., looking east from Rigsbee Ave., 1900. The building on the northeast corner of East Chapel Hill St. and Rigsbee Ave. was built sometime between 1913 and 1924, likely in the early 1920s. Early on, the structure housed a hardware store. 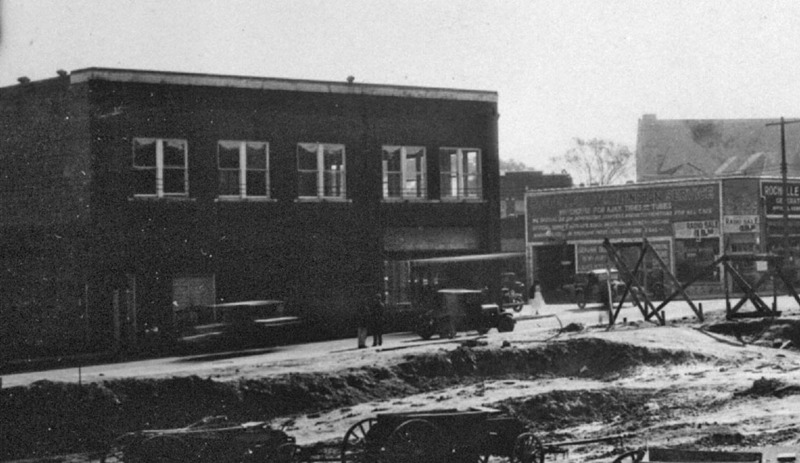 A view of 400 E. Chapel Hill looking across Rigsbee from the post office construction site, 1934. A partial view of the facade, looking north-northwest down Rigsbee. The Big 4 warehouse is visible in the distance, and the post office is to the left. A blow-up view of the window, where you can see pots and mason jars. 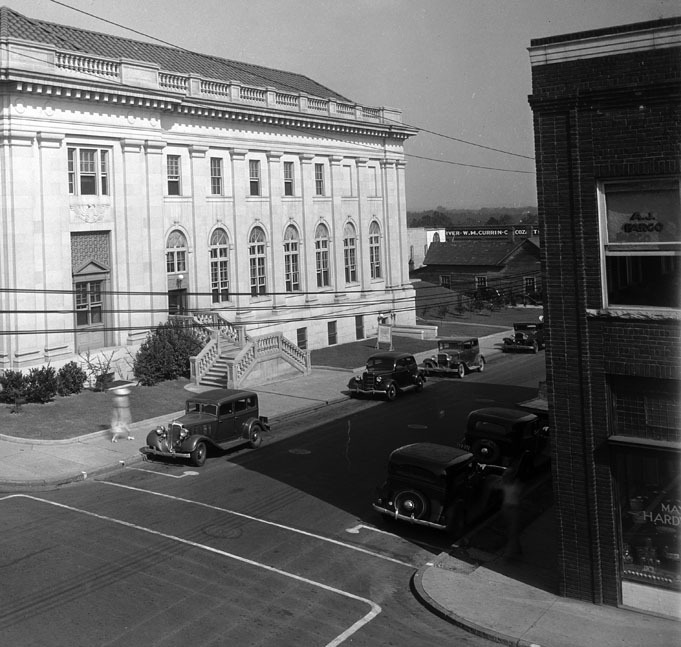 Above, the view in 1945, when the building housed the "R&M Cafe." A Pet Dairy Products sign appears to be in front of the building. An early morning view looking east past the Post Office at the "C & W cafe"
MAYFLOWER CAFE, 401 E. Chapel Hill St., is owned by W.R. Hedrick, who came to Durham in 1926 and on August 20, 1927 married Miss Esther Mae Sneed. They have three children: Wesley Sneed, Patsy Mae, and James Ray. Mayflower Cafe specializes in home cooked food. Mr. and Mrs. Hedrick are Baptists. Mr. Hedrick is a Pythian. 401 served a later stint as a toy store. 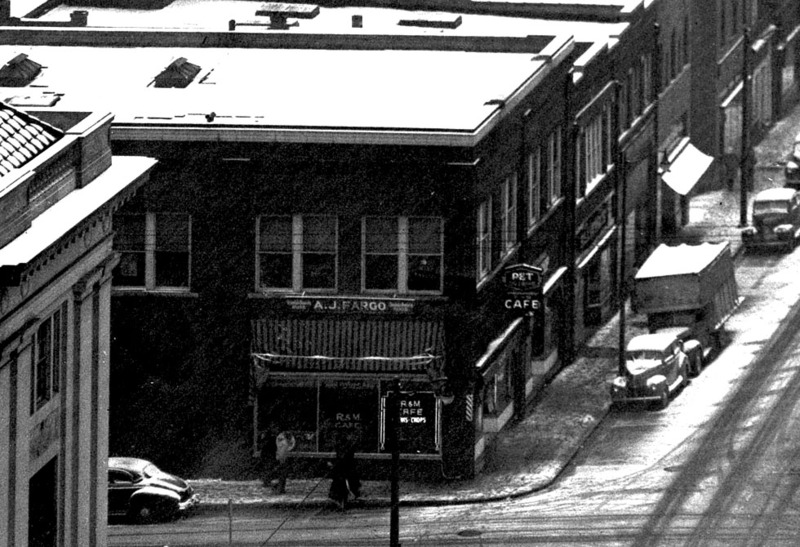 The view in 1963, looking north from Rigsbee and Mangum. A vertical sign is visible on the corner of the building, but not readable from this angle. A barber shop is located in the eastern half of the building. Looking north, 1966. This fuzzy pic serves primarily to show the billboard that had appeared atop the building. This building remained barbershop then beauty salon for many years with, I believe, a seamstress upstairs. This past fall, the owners of Pop's decided to brave the real, core downtown with an endeavor I am sure many people tried to dissuade them from doing. I don't know how their numbers look, but there always seems to be business at Rue Cler, and a regular crowd for weekend evenings and brunch. Not only is it a good restaurant, but having a successful, good restaurant had taken the seeming stigma away from dining options downtown. At least that's my hope, and the recent announcement of a restaurant in the old fire station #1 seems to substantiate this.